In their recent meeting, the Clubs and Events Board (CAEB) discussed upcoming events that will be held next semester at American River College. Among the discussions were the Murder Mystery Dinner and the Club Day that will be held in the semester of 2017. 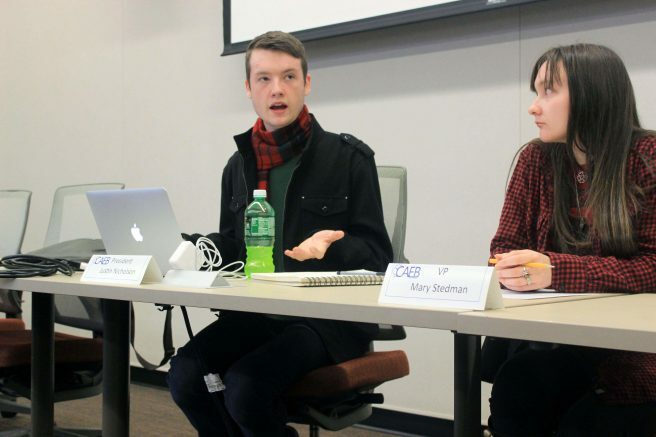 Two grant bills for Sociology Club and the Progressive Democrats Club were passed for $150. Held off campus, the Murder Mystery Dinner will be an interactive comedy dinner show where the audience will attempt to figure out which performer is the murderer. Advisor Juan Blanco and Director of Media Relations Kylie Marx suggested ideas for the setting and theme of the Murder Mystery Dinner. Marx’s idea for the Mystery Dinner was based on an episode of the television show “The Twilight Zone” where aliens could interact with humans. CAEB officers and club representatives agreed to have the Murder Mystery Dinner on March 9 of next year. CAEB President Justin Nicholson spoke about the possible theme for the February Club Day. “I know that one week we were discussing ‘Stupid Cupid’ which would be a battle of the romantics,” Nicholson said. Nicholson said that the ideas for the games should bring a togetherness for groups. “The ideas that we will have will be a lot of group building games throughout the day,” Nicholson said. CAEB unanimously passed a $150 grant for the Sociology Club and Progressive Club with a vote of 10-0. Be the first to comment on "CAEB discusses events for next semester"